Teriyaki, the dish that the New York Times called Seattle’s version of the Chicago dog, is fading from the collective food brain of the city, as the residents who remember its heyday get priced out of their neighborhoods -- along with the restaurants that served it. For the newly arrived inhabitants taking over, teriyaki holds none of the worldly authenticity of phở nor the trendy uber-local appeal of foraged mushrooms. As the city continues to grow at one of the fastest rates in the nation, its signature dish is getting left behind: there are a third fewer teriyaki restaurants in Seattle today than there were a decade ago. What happened? Sweet and sticky with sauce, all Seattle-style teriyaki stems from the basic formula Toshihiro Kasahara developed when he opened his first shop, Toshi’s Teriyaki, in 1976. The meat, traditionally chicken thighs slippery and brown from marinade, gets slapped on a hot grill. The high heat caramelizes the sugars, crisping the meat and leaving it with a crunch of barely burnt soy on the outside. Sliced into bite-size pieces, it’s served fanned out across a molded mound of white-as-snow rice, the sauce seeping down between the grains. The salad, like the meat, is sweet and crunchy, the iceberg lettuce and slivers of carrot and cabbage reminiscent of coleslaw, with only the rice vinaigrette separating it from old-school American picnic fare. There are a third fewer teriyaki restaurants in Seattle today than there were a decade ago. Toshi’s Teriyaki opened its doors on Roy Street in 1976 to almost no fanfare. Business started off slow for the transplant. After graduating from Portland State University, Kasahara had moved to Seattle from Portland, looking for better opportunities. He attended school as a competitive wrestler, but wanted to become an interpreter. However, that's not exactly how things turned out. “All of my friends had restaurants,” says Kasahara, so he figured why not follow suit. While his pals ran traditional Japanese restaurants, Kasahara wanted to specialize. Specifically, he wanted to find something he could operate without depending on other people, “so when they quit, I could still manage it." “I wish I could say it’s from my ancestors,” Kasahara remarks of the recipe he developed. He always liked cooking growing up, but the closest he can come to defining the origins is to say that what he makes is similar to the Japanese version of teriyaki -- a light finishing of soy sauce, sake, and mirin (rice wine) brushed onto grilled or broiled proteins, often seafood. Wherever it came from, teriyaki was a knockout. Kasahara owned -- or franchised -- as many as 17 stores, including one in Phoenix. Copycats and rogue former franchises sprung up, as the Seattle Times put it, “like mushrooms in a damp meadow.” There was Toshio’s, Toshi’s Teriyaki the Original, Yoshi’s, Yoshino, Yasuko’s, and so on. 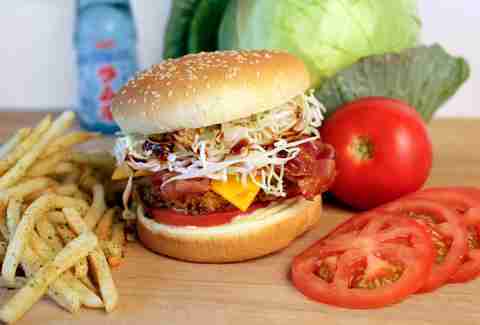 Today, there are nationwide teriyaki chains: both Teriyaki Madness and Glaze Teriyaki operate around the country. Teriyaki Madness, which stemmed from a local shop partnering with two former customers, now operates an impressive 31 outlets in 14 states, with 18 more opening this year. CEO Michael Haith is bullish on the popularity, both with customers (“It's a flavor that everyone can relate to, it's healthier, and it's on the go”), and his franchisees, many of which are now opening a second or third location. But for Kasahara, after building up the franchise business, he had to admit he wasn’t cut out for it. “I didn’t really have the management skills. It was a hassle.” For a while, he stepped out of the teriyaki business entirely, but he couldn’t stay away. 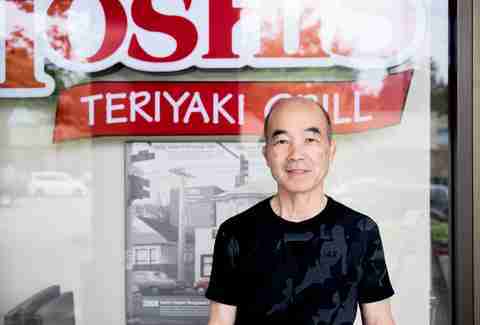 Now he cooks in a single three-table shop buried deep within the buildings of a Mill Creek strip mall called Toshi’s Teriyaki Grill. As quickly as the teriyaki tide rises around the country (part of the Asian fast-casual category that’s the fastest growing restaurant segment in the country), it's ebbing in Seattle. The shops fall victim to the same problems as any other small, family-run business. Of the 15 teriyaki shops we rounded up as the best in town in 2014, two have closed (Yasuko's and Setsuna), one changed hands (Katsu Burger), and another is slated to close later this year (King Donuts, as the owners have decided to retire and have no one to take it over). It's a testament that even the best can’t survive. Teriyaki used to be the ultimate everyman meal. In 2015, Yasuko Conner closed her namesake teriyaki shop on Broadway after more than twenty years. Long a haven of affordable food alongside the now rapidly gentrifying tracks of the new streetcar, a combination of declining business and rising property taxes -- the assessed value of the building increased 129% that year -- sounded the death knell for the tiny Yasuko’s. The bare walls (blank except for the haphazardly posted and amended menu) hid the vibrancy of the flavors served. The floors, tables, and chairs were all colorless save for mysterious stains, remnants left behind by the customers, homeless, working-class, and affluent alike, plus a good smattering of Seattle’s high school students, coming together in a place serving simple food at eminently reasonable prices. Teriyaki was the ultimate everyman meal. These days, Amazon workers living in new high-rises get whisked by the building’s corner aboard the streetcar. For lunch, they’ll choose between sushi delivered by Uber and pizza cooked by one of Seattle’s star chefs. Teriyaki doesn’t enter the equation. Its legacy in Seattle, the city where Kasahara created it, is fading. In 2010, John T. Edge wrote an ode to Seattle teriyaki for The New York Times. He quotes Knute Berger, elder statesman of Seattle media, as saying the shops are “so ubiquitous as to have become invisible.” And once invisible, they actually disappear; two of the four restaurants Edge focused on have since closed. For those who grew up in Seattle, teriyaki was a way of life. Eula Scott Bynoe of the podcast Hella Black Hella Seattle tells the story of bringing a dying relative teriyaki from a favorite spot: "I was there to say goodbye," but the relative, a Seattle native, she joked, "just wanted the teriyaki." For new transplants, the simple dish doesn't fit the narrative of the shiny, new city. Teriyaki shops -- dirty and run-down -- aren't listed on any hot lists of where to eat in Seattle. Not in Seattle Metropolitan's 30 restaurant experiences you "must have," nor in alt-weekly The Stranger's "Eat Like a Local." To Seattle’s latest Amazon and Microsoft recruits -- living here as Seattle earned (and is still earning) acclaim for its culinary scene -- the city was built on Copper River salmon and Taylor Shellfish oysters. A place where neighborhood restaurants like Anchovies & Olives shuck bivalves fresh daily and serve pristine fish, even away from the waterfront tourist traps. To have arrived in Seattle in the last five years was to watch Zoi Antonitsas and Jason Stratton both win Food & Wine "Best New Chef" awards and appear on Top Chef, to see Ethan Stowell's combination of Northwest and Italian cuisines spread to more than a dozen outlets, to taste Blaine Wetzel's food at Willows Inn and Jamie Boudreau's drinks at Canon -- as each were celebrated for being one of the world's best restaurants and bars, respectively. For new transplants, the simple dish doesn't fit the narrative of the shiny, new city. In the end, it comes back to a universal appeal: “There's a sincerity to it, from the owners, that really translates. It's comfort food,” states Haith. And he's right. What Teriyaki Madness does is not only imitate the meals that have drawn in Seattleites for decades, but also the environment that bred it. The corner store-style service, the friendly face behind the counter, the bare-bones atmosphere. The dish that Kasahara came up with to open his small Queen Anne shop, with its mangled roots... if it's authentic anything, it's authentically old Seattle. But new Seattle -- with the locals priced out of the area, those that remain forgetting teriyaki exists, and newcomers ignoring it -- risks losing those real shops for good. Teriyaki could be heading the direction of deep-dish… just ask a Chicagoan about it and they’ll say, “Oh, that’s for tourists.” Teriyaki is from a different era, and it’s fading as fast as traffic-free days on I-5. Since teriyaki came to town, Seattle’s waved goodbye to the Kingdome, Kurt Cobain, and the Sonics. A signature stadium, a signature musician, a signature team -- and now, perhaps, a signature dish. As cryptic as that may sound, it's still not too late. There are still shops that marinate their chicken and make that perfect teriyaki rice, that use fresh ingredients behind the closed doors of their sauce-stained kitchens. Sixty-six shops remain in Seattle with teriyaki in their name -- plus one special one in Mill Creek. And Kasahara, like Seattle teriyaki itself, isn’t ready to be counted out quite yet: “I’m not quitting. I’m waiting to see how things go here.” Meanwhile, it’s up to Seattle’s umbrella-shunning stalwarts, incoming Amazon hordes, and everyone in between to know -- and support -- what’s great about Seattle. To eat teriyaki. To support the small businesses, the independent shops, the unique and wonderful cuisines that define the town. By eating an affordable, delicious meal, you can save one more bit of old Seattle from going the way of grunge. And wouldn’t that be something? Naomi Tomky grew up splitting her teriyaki time between Nasai on The Ave, Teriyaki Bowl in Madison Park, and Yasuko's on Broadway. Follow her edible adventures on Twitter @Gastrognome and on Instagram @the_gastrognome.